Bricks refer to a workout that includes two disciplines, typically swim-to-bike or bike-to-run. This style of workout helps you prepare your body for the unique challenge of moving from one sport to the next in a single race, while minimizing any major drop in your performance. The most common brick workout for triathletes is the bike-to-run, as this is often the toughest transition to handle. When you come off the bike, your legs will feel heavy and slow– like they are made of bricks. As with any movement, practice can improve how your body responds and reduces the impact to your run performance. Our goal is to help that transition to feel almost normal so you are ready to run. Typically, I introduce brick workouts into training about 12 to 16 weeks prior to the first race of the season. If you have a particularly hard time shifting from the bike to the run, you may also consider keeping short bricks in your training throughout the year. Your first brick workout can be as easy as adding a one mile run as soon as you finish a bike workout. Although simple, this will help you get used to that transition and you’ll notice that this brick becomes easier after just a few weeks. As your training progresses, you can slowly increase both the intensity and distance of the run to closer reflect the race you are training for. You can also use your brick workouts as an opportunity to practice your transitions. Try setting up a small transition station and time your bike-to-run movements to see how quickly you are ready to run. The more you practice the order you take off your helmet, switch shoes, and grab your race belt, the smoother and more efficient your movements will become. If you’re just getting started with brick workouts, try adding one brick each to your training plan. As you gain more experience, you can increase the frequency of your brick workouts, even turning each bike workout into a brick session. As with all training, increase your volume slowly to minimize your injury risk. You can also seek out the guidance of a triathlon coach to help maximize your training time and your race results. Below are two brick workouts that you can use in your training based on your current experience level and distance that you are training for. Transition: Practice a quick and efficient transition. Aim to keep the time under 60 seconds. 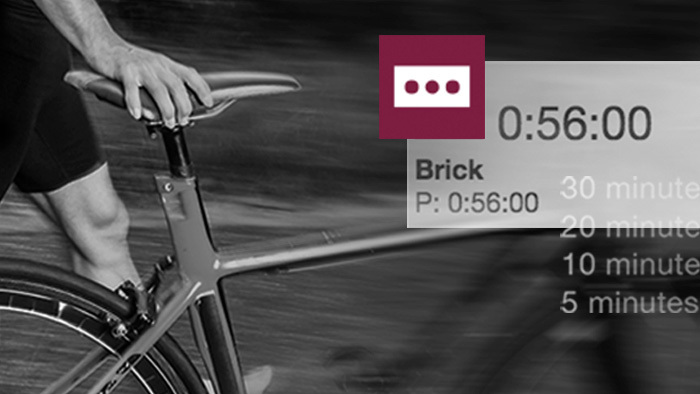 Using brick workouts is a great way to prepare for the specific demands of race day. Adding them to your training at the right time, and understanding their purpose, will allow you to get the most from these sessions.